Toby Keith, one of the most successful country artists of the 1990s and 2000s, had his first number one in 1993. Hot Country Songs is a chart that ranks the top-performing country music songs in the United States, published by Billboard magazine. In 1993, 33 different songs topped the chart, then published under the title Hot Country Singles & Tracks, in 52 issues of the magazine, based on weekly airplay data from country music radio stations compiled by Nielsen Broadcast Data Systems. The number one song at the start of the year was "Don't Let Our Love Start Slippin' Away" by Vince Gill. It remained in the top spot until the chart dated January 16, when it was replaced by "Somewhere Other Than the Night" by Garth Brooks. Brooks also topped the chart with three other songs during the year, "That Summer", "Ain't Goin' Down ('Til the Sun Comes Up)" and "American Honky-Tonk Bar Association", giving him the most number ones of an artist in 1993. The total of five weeks which the songs spent at number one was the highest total by any act during the year. Tracy Lawrence and Vince Gill each had three number ones during the year, Gill's total including "The Heart Won't Lie", a duet with Reba McEntire. The longest unbroken run at the top was the four weeks which Alan Jackson spent at number one with "Chattahoochee". In 1993, Toby Keith, who would go on to become one of the most successful artists in country music history, scored his first number one when "Should've Been a Cowboy" reached the top spot in June. The song would go on to become the most-played country song of the 1990s, having received three million spins since its release, according to Broadcast Music Incorporated. Other artists to reach the top spot for the first time in 1993 included Sammy Kershaw with "She Don't Know She's Beautiful" in April, John Michael Montgomery with "I Love the Way You Love Me" in May, Clay Walker with "What's It to You" in October, and Doug Supernaw, whose song "I Don't Call Him Daddy" was the final number one of the year. Randy Travis topped the chart for two weeks in January with "Look Heart, No Hands". Alan Jackson's "Chattahoochee" had the longest run of the year at the top of the chart, spending four weeks at number one during July and August. 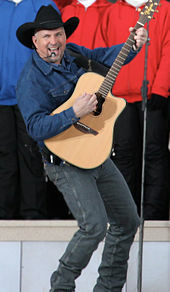 Garth Brooks had four number ones in 1993, the only artist to achieve this feat. Tracy Lawrence had three number ones during the year, second only to Brooks. "Too Busy Being in Love"
"Can I Trust You with My Heart"
"Why Didn't I Think of That"
"Can't Break It to My Heart"
^ "100 Greatest Country Artists of All Time". Rolling Stone. June 15, 2017. Retrieved November 27, 2017. ^ Thompson, Gayle (April 29, 2013). "Krystal Keith's Childhood Not Affected by Father's Fame". The Boot. Townsquare Media. Retrieved November 27, 2017. ^ Shelburne, Craig (March 1, 2007). "Toby Keith Jams, Notches 50 Million Airplays". CMT. Retrieved November 24, 2017. ^ Huey, Steve. "Sammy Kershaw Biography". AllMusic. Retrieved November 27, 2017. ^ "John Michael Montgomery Chart History". Billboard. Retrieved November 27, 2017. ^ Powell, Larry. "Clay Walker". AllMusic. Retrieved November 27, 2017. ^ "Doug Supernaw Chart History". Billboard. Retrieved November 27, 2017. ^ "Hot Country Songs chart for January 2, 1993". Billboard. Retrieved October 3, 2010. ^ "Hot Country Songs chart for January 9, 1993". Billboard. Retrieved October 3, 2010. ^ "Hot Country Songs chart for January 16, 1993". Billboard. Retrieved October 3, 2010. ^ "Hot Country Songs chart for January 23, 1993". Billboard. Retrieved October 3, 2010. ^ "Hot Country Songs chart for January 30, 1993". Billboard. Retrieved October 3, 2010. ^ "Hot Country Songs chart for February 6, 1993". Billboard. Retrieved October 3, 2010. ^ "Hot Country Songs chart for February 13, 1993". Billboard. Retrieved October 3, 2010. ^ "Hot Country Songs chart for February 20, 1993". Billboard. Retrieved October 3, 2010. ^ "Hot Country Songs chart for February 27, 1993". Billboard. Retrieved October 3, 2010. ^ "Hot Country Songs chart for March 6, 1993". Billboard. Retrieved October 3, 2010. ^ "Hot Country Songs chart for March 13, 1993". Billboard. Retrieved October 3, 2010. ^ "Hot Country Songs chart for March 20, 1993". Billboard. Retrieved October 3, 2010. ^ "Hot Country Songs chart for March 27, 1993". Billboard. Retrieved October 3, 2010. ^ "Hot Country Songs chart for April 3, 1993". Billboard. Retrieved October 3, 2010. ^ "Hot Country Songs chart for April 10, 1993". Billboard. Retrieved October 3, 2010. ^ "Hot Country Songs chart for April 17, 1993". Billboard. Retrieved October 3, 2010. ^ "Hot Country Songs chart for April 24, 1993". Billboard. Retrieved October 3, 2010. ^ "Hot Country Songs chart for May 1, 1993". Billboard. Retrieved October 3, 2010. ^ "Hot Country Songs chart for May 8, 1993". Billboard. Retrieved October 3, 2010. ^ "Hot Country Songs chart for May 15, 1993". Billboard. Retrieved October 3, 2010. ^ "Hot Country Songs chart for May 22, 1993". Billboard. Retrieved October 3, 2010. ^ "Hot Country Songs chart for May 29, 1993". Billboard. Retrieved October 3, 2010. ^ "Hot Country Songs chart for June 5, 1993". Billboard. Retrieved October 3, 2010. ^ "Hot Country Songs chart for June 12, 1993". Billboard. Retrieved October 3, 2010. ^ "Hot Country Songs chart for June 19, 1993". Billboard. Retrieved October 3, 2010. ^ "Hot Country Songs chart for June 26, 1993". Billboard. Retrieved October 3, 2010. ^ "Hot Country Songs chart for July 3, 1993". Billboard. Retrieved October 3, 2010. ^ "Hot Country Songs chart for July 10, 1993". Billboard. Retrieved October 3, 2010. ^ "Hot Country Songs chart for July 17, 1993". Billboard. Retrieved October 3, 2010. ^ "Hot Country Songs chart for July 24, 1993". Billboard. Retrieved October 3, 2010. ^ "Hot Country Songs chart for July 31, 1993". Billboard. Retrieved October 3, 2010. ^ "Hot Country Songs chart for August 7, 1993". Billboard. Retrieved October 3, 2010. ^ "Hot Country Songs chart for August 14, 1993". Billboard. Retrieved October 3, 2010. ^ "Hot Country Songs chart for August 21, 1993". Billboard. Retrieved October 3, 2010. ^ "Hot Country Songs chart for August 28, 1993". Billboard. Retrieved October 3, 2010. ^ "Hot Country Songs chart for September 4, 1993". Billboard. Retrieved October 3, 2010. ^ "Hot Country Songs chart for September 11, 1993". Billboard. Retrieved October 3, 2010. ^ "Hot Country Songs chart for September 18, 1993". Billboard. Retrieved October 3, 2010. ^ "Hot Country Songs chart for September 25, 1993". Billboard. Retrieved October 3, 2010. ^ "Hot Country Songs chart for October 2, 1993". Billboard. Retrieved October 3, 2010. ^ "Hot Country Songs chart for October 9, 1993". Billboard. Retrieved October 3, 2010. ^ "Hot Country Songs chart for October 16, 1993". Billboard. Retrieved October 3, 2010. ^ "Hot Country Songs chart for October 23, 1993". Billboard. Retrieved October 3, 2010. ^ "Hot Country Songs chart for October 30, 1993". Billboard. Retrieved October 3, 2010. ^ "Hot Country Songs chart for November 6, 1993". Billboard. Retrieved October 3, 2010. ^ "Hot Country Songs chart for November 13, 1993". Billboard. Retrieved October 3, 2010. ^ "Hot Country Songs chart for November 20, 1993". Billboard. Retrieved October 3, 2010. ^ "Hot Country Songs chart for November 27, 1993". Billboard. Retrieved October 3, 2010. ^ "Hot Country Songs chart for December 4, 1993". Billboard. Retrieved October 3, 2010. ^ "Hot Country Songs chart for December 11, 1993". Billboard. Retrieved October 3, 2010. ^ "Hot Country Songs chart for December 18, 1993". Billboard. Retrieved October 3, 2010. ^ "Hot Country Songs chart for December 25, 1993". Billboard. Retrieved October 3, 2010. This page was last edited on 7 March 2019, at 06:09 (UTC).